I recently had a conversation with a pilot (male) friend of mine. This came after Easyjet published their pay gap data in January, exposing a huge 52% pay gap (although some articles have since reported this as a 45.5% pay gap). Airline Tui have just published their data too, revealing that they have a 47.3% pay gap between the men and women in their employment. And so a trend, if not a surprising one, is beginning to emerge. Both Tui and Easyjet have blamed their pay gaps on the fact that most of its pilots are men, while most of its more “modestly paid” cabin crew are women. Currently only 6% of Easyjet’s pilots are women and while this is definitely a reason for their pay gap being so large, it should absolutely not be read as an excuse. In my discussion with my pilot friend, he applauded Easyjet for having even 6% women pilots, telling me how hard they must have worked to get it this high. “They must have recruited every new female pilot in the UK!” he exclaimed, and I am inclined to believe him. He then went on to explain, quite earnestly, that women simply “don’t want the job”. And this is where I do not believe him. This argument is always being dragged out when discussing the pay gap; women don’t want to be CEO’s/doctors/pilots/engineers and so on and I struggle to believe the idea is based on any truths. But, I protested, surely it is then down to these airlines to make their female pilots visible to young women, to inspire them to take up the controls and show them it they can do it. No, he said, it’s not the company’s responsibility to change the minds of young women. But it is. If you are not recruiting the people you want, whatever your industry, you need to change your tactics. It may be the way that you are communicating about the roles is unintentionally attracting a certain type of person, and therefore excluding others. They need to showcase and celebrate their female pilots because without real, visible role models that look like you it’s hard to picture yourself in a job. They also have a responsibility to change the minds of the general public, a large proportion of whom seem to have an unconscious (or maybe sometimes conscious) bias that makes them nervous to hear a woman’s voice coming from the cockpit, and seeing more women doing the job would help to achieve this. In the defence of airlines, they do actually seem to have finally recognised the problem: in 2015 Easyjet launched its Amy Johnson initiative, underwriting the loans of six new female recruits each year; British Airways launched a campaign in 2014 to increase the visibility of women pilots by actively visiting schools and attending recruitment event; and Virgin Atlantic launched its Future Flyers Programme, aiming to increase diversity in their cockpits across the board. But in the age of social media it is the pilots themselves who are also able to make themselves really visible. Maria Pettersson (@pilotmaria) is a Boeing 737 NG pilot with a whopping 456k followers on Instagram and has made it her job to inspire and advise other aspiring pilots through her social media accounts and website. “My story,” she says “is about strong females in a male dominated environment. Proving that we are just as good as them. Believing in ourselves and keeping a positive attitude towards life.” Other female pilots taking over Instragram are Maria Fagerström (@mariathepilot), a Swedish Pilot, and Lindy Kats (@pilot_lindy), a Dutch Boeing 717 Pilot. Surprised by the popularity of her Instragram account (currently at nearly 120K followers) Kats told CNN Travel “If people tell me they are inspired, this is one of the best compliments that I could get”. I recommend following them purely for the envy-inducing photographs that couldn’t help but move you to jump into the cockpit! My friend doesn’t see the restrictions that women see when approaching careers that are currently male dominated. As a man he had no perceived or real barriers into his chosen career (apart from maybe a financial one as it can cost over £100k to train as a commercial pilot) and probably doesn’t see that it might have been different for a woman. And that’s not his fault. It’s hard to see things from a different point of view when you’re unknowingly looking at life from a point of privilege, afforded to you by a patriarchal society. 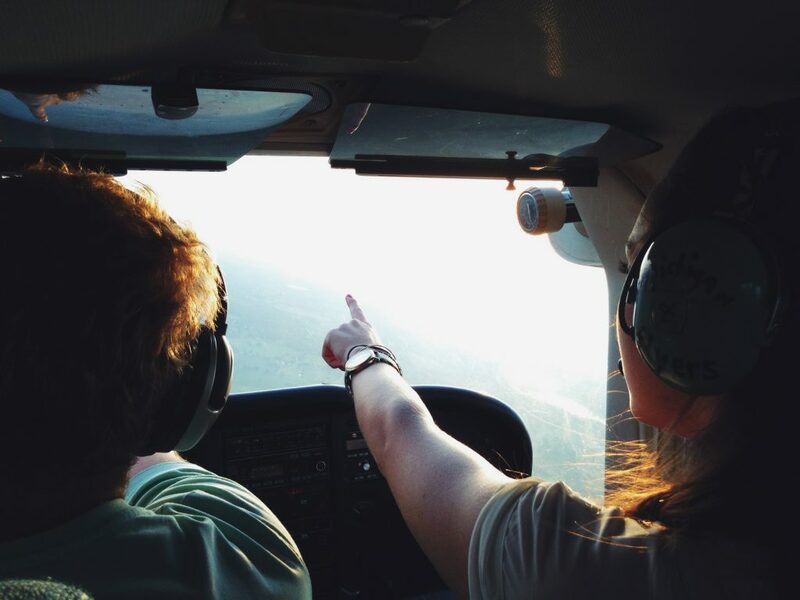 One thing he did say to me, that I really hope is true, is that, while it might take a long time, the ratio of female to male pilots will naturally change for the positive as newer generations grow up without such obvious gender biases in the media, in the classroom and at home. But I don’t want to wait for society to change. I want to see more women in the cockpit and soon.